← amy tangerine by american crafts. authentique, october afternoon, and fondue crop! …and yes, I decided to scrap Mr. Hilo again. I felt like the title needed to stand out more, so I made a heart using some leftover twine I had lying out on the table. I know it’s only July, well almost August, but we got Halloween stuff in the store all ready! Authentique was quick about shipping all of their stuff out to the store, so I couldn’t resist. I had to use our Jalloween photos, haha. Last but not least, October Afternoon‘s Boarding Pass arrived too. The drummed down colors mixed with the brightness of the paper went perfectly with these sepia photos. …and that twine has been one of my recent favorites! Last but not least, there was a fondue crop yesterday at Our Paper Place. Tons of people and lots of scrapbooking going on. It was so good to see and spend time with some of my scrappin’ buddies. I can’t wait for the next event, Tea for Two! It’ll be a day with classes, cupcakes, iced tea, the color PINK, and lots of crafting. Now, I’m gonna go relax. It’s been a long day playing by the ocean.The dogs are all ready passed out, and I think I’m about to join them, hehe. Love seeing how you use all the new papers. Love your layouts (who doesn’t?!). Sure wish I could be there for the “Tea for Two” crop … bet that will be fun, fun, fun! OMGosh, a fondue crop! Why oh why don’t I live near you?? Actually, I did get to have fondue myself this past weekend, for the first time ever….we got the chocolate dessert bar fondue for a girlfriend’s birthday…..so fun! 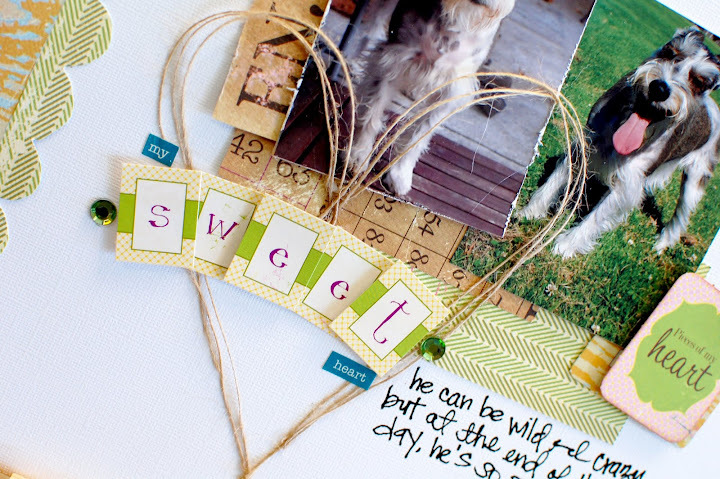 Love, love all your scrappy projects. That twine heart had my jaw dropping. I LOVE that! 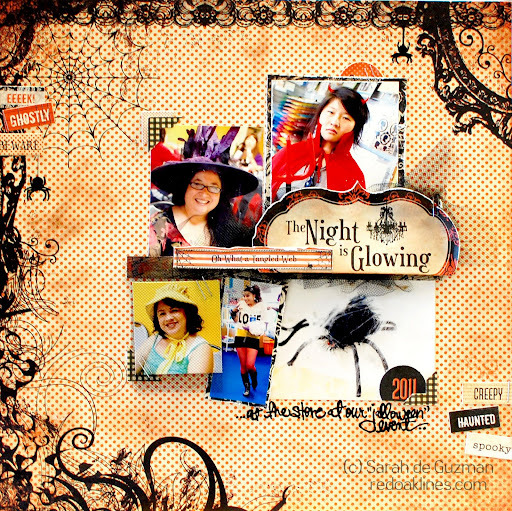 Adore all things Halloween, so that layout really caught my eye. I’m going to have to have that line. 😉 And fabulous photos of you! Love the arrangements. Always, always love your work, Sarah! Looks like there’s a lot of fun going on at your store! Your Halloween layout makes me want it to be October soooo badly! Love it! All your layouts are stunning! cuuute layouts. I had such a fun time at the crop! hey chica!! thx for your sweet comment on my blog, sorry i’ve been MIA in blogland for awhile! 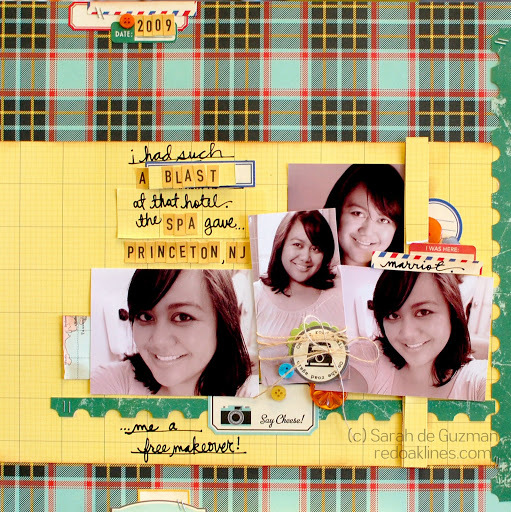 ahhh, loving the serious eye candy on your blog!! that twine heart is FABULOUS! I LOVE these layouts! Especially the one with mr. hilo–he’s got so much personality! And look at you all done up pretty–you’re GORGEOUS!! 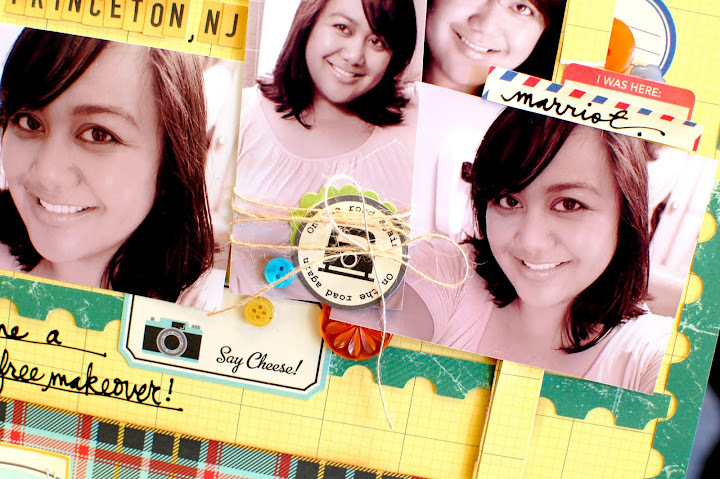 super cute layouts. sounds/looks like the crop was fun. looking to try to make it up this week. will text to see that you will be there. hugs. lovely fresh designs with the new goodies ! love ’em !